When facts talk, you know what walks, so the benchmark tests of the upcoming Samsung Galaxy Note Incredible Hulk of a phone are the true tests of its pimped up dual-core 1.4GHz Exynos SoC. The Samsung Galaxy S II and its versions provide the best performance/battery life ratios in the Android world, as it manages to blow past the dual-core competition, and still have decent time between charges. In this case, the Galaxy Note should fare even better in benchmarks, provided that the CPU has been overclocked with a 0.2GHz step. A set of those synthetic measurements of mobile silicon capabilities proves exactly that - the Samsung Galaxy Note manages to beat not only the HTC Sensation, based on Qualcomm's Snapdragon S3, and the LG Optimus 3D, based on TI's OMAP4 processor families, but also its own older brother the Galaxy S II. The only test where the Samsung Galaxy Note gave way to the Galaxy S II is in NenaMark 2's graphics performance results, which is explicable considering all those 800x1280 pixels on the gargantuan 5.3" display that have to be filled. Even at 30 frames per second it is a pretty svelte showoff. 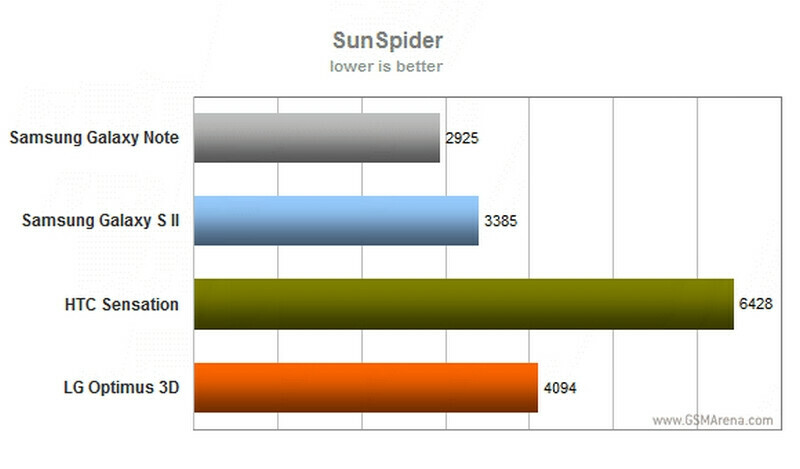 We are especially pleased with the SunSpider results, indicating that browser performance could be even smoother than in the Samsung Galaxy S II, which is already crazy quick. Samsung Galaxy Note is a beast of a phone. I love that HUGE 5.3" 800x1280 screen. I don't know what I should get? 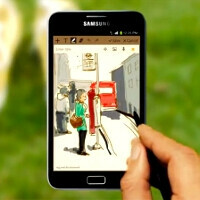 The Samsung Galaxy Note, or the Google Nexus Prime? Nexus Prime. It will be faster than the SGS2, have ICS and receive updates directly from Google instead of waiting for your carrier to roll them out. Yea I agree with you! The Google Nexus Prime is going to be the sh*t! Get the note that screen is huge imagine games and viewing web pages and taking note will be awesome!!!!!!!!!!!!!!!!!!!!!!!!!!!!!!!!!!!!!!!!!!!!!!!!!!!!!!!!!!!! It may not be THAT faster. The rumors are a 1.5 GHZ dual-core processor. Some rumors are pointing to TI-OMAP, which isn't faster than Exynos. Other rumors point to it being Exynos. Either way, this is a 1.4 GHZ dual-core Exynos processor. 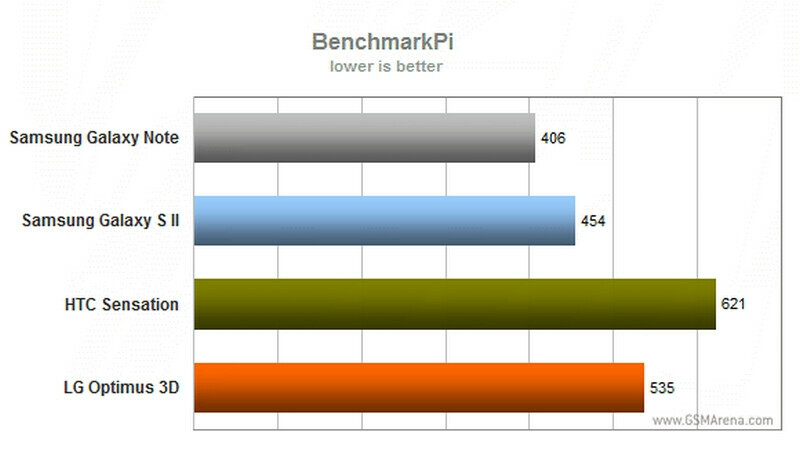 So, even if the Prime is a 1.5 GHZ Exynos processor it shouldn't be that much faster. 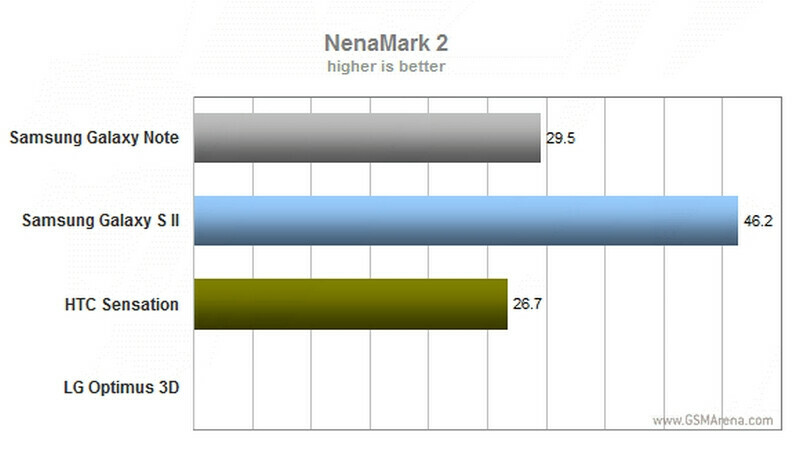 Of course you are going to see gains in the benchmarks, but I don't believe it will be by much. Really, the question is like kenshiro pointed out the updates as well as screen size. 4.65" (rumored) screen for the Prime or the 5.3" of this phone? For all we know it could be omap5 or S3 and not exynos. There have been no confirmations as far as I have found and the gs2 for tmobile uses the S3. I doubt they will use the S3 but omap5 is a possibility for LTE support. lol, its not going to be the S3. If its an S3, ill buy an iphone4S.. lol. Right now it seems that its up in the air for either the OMAP or the Exynos Gen 2. Considering the power gains on an already uber powerful chipset, im really really hoping its the Exynos. It would also make more sense to me considering each Nexus has either introduced us to new chips (nexus1 with snapdragon) or used the best tech available (Nexus S with Hummingbird and S.Amoled). 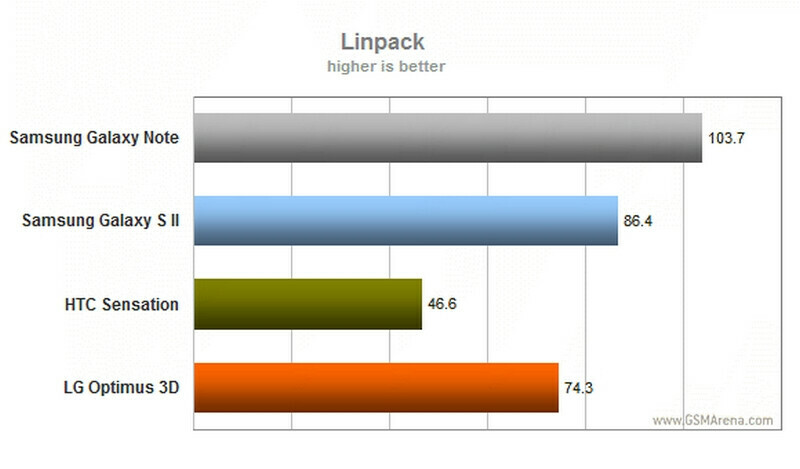 The OMAP chipset is a great chipset but it is neither new nor is it the king of the hill. The Exynos 2nd gen would fit both bills quite nicely. Of course, thats just a tech fan's dream come true if it happens...lol and again, im not trying to take anything away from the note or the SGS2 as both are just packed to the gills with excellent tech. regarding the gs2 updates i look for my updates on my own. whats the hate against ths gs2? please guys. admit the galaxy still is a nice phone man. i love mine. the nedus maybe will be better but i keep loving my international version. just update to 2.3.5 and the phone is way more stable. android all the way. They're not hating. They just prefer the Note. who is hating? the SGS2 is a king and a monster. The note isnt out yet. The only difference is the Exynos in the note is clocked up a lil higher. You can easily fix that by rooting the phone and overclocking it. Otherwise the only real difference is the higher screen rez on the note and that stylus input. SGS2, Note, Prime.. either way, you win. Exactly buddy....But I am at a fix here....I dont know if I should go for nexus prime or hold on to my SGS2 till the behemoth SGS3 arrives........ Any suggestion guys? if you have an SGS2 already, hold on to it. You can have XDA hack ICS onto the phone easily, and you basically have the prime with physical buttons. Hold out for the SGS3 and its quadcore madness. If you didnt already have a top tier handset Id say go with the prime. If thats not available on your carrier, the Note and SGS2 would be excellent alternate phones. the SGS3 will not launch in america in Q2, if thats what your worried about. Unless something drastically changes, we normally have a 3-6 month lag from when it launches in Korea.. so you wont see it till summer/xmas of 2012. Get it out of your mind for now.. lol. Thats like these guys already talking about next years iphone5. the 4s hasnt even released. The SGS2 is a long way from out dated. It will be king until the Nexus (if it has exynos gen2) or until Quad cores drop on the market... and even then it will be high end, just not king. "real difference is the higher screen rez on the note and that stylus input" Yes, give me the 'old' stylus. I have been waiting for it's return. This phone looks awesome but I think I want the Nexus Prime more. I'm on AT&T and for some reason I don't think they will get the prime anytime soon. My guess for the holidays is: Verizon: Nexus Prime AT&T: Galaxy Note Sprint:? T-Mobile:? Sprint: Epic Touch T-Mobile: Galaxy S2 ...seemed obvious to me. AT&T also has the GS2 but not the 4.5" version. So they get the Note. Tmobile will have the prime. They are the only carrier to have had every nexus phone. They have also launched the first 2 so i doubt that IF vzw has exclusivity, it will be for very long. Is the Note really going to have LTE support on the AT&T?? if so that's enough of a reason for me to get the Note. that is one beast of a phone/tablet/notepad/slate/etc. Would love to own one..! wait a minute- it's cool how fast the note is but to compare it to the gs2 is not even a comparison, I mean isn't the note only available on atnt? Also I thought for sure that the Prime is coming out with the OMAP 4430 turbo or the 4460? Google had that announced didn't they? this is not actually this is just a comparison without evidence of who makes samsung These facts? what not to believe everything written. As an AT&T loyalist, I'm going to be torn between the Note, SGSII, and the Iphone 4S.